Mr. Maazel’s performances could seem fastidious and emotionally distant as well as fiery and intensely personalized. NEW YORK — Lorin Maazel, a former child prodigy who held the music directorships of the New York Philharmonic, the Cleveland Orchestra, the Vienna State Opera, and several other ensembles and companies around the world and who was known for his incisive and sometimes extreme interpretations, died Sunday at his home in Castleton, Va. He was 84. The cause was complications of pneumonia, said Jenny Lawhorn, a spokeswoman for Mr. Maazel. He had been rehearsing for the Castleton Festival, which takes place on his farm, in recent weeks. Mr. Maazel was a study in contradictions, and he evoked strong feelings, favorable and otherwise, from musicians, administrators, critics, and audiences. He projected an image of an analytical intellectual — he had studied mathematics and philosophy in college, was fluent in six languages (French, German, Portuguese, Spanish, and Italian, as well as English) and kept up with many subjects outside music — and his performances could seem coolly fastidious and emotionally distant. Yet such performances were regularly offset by others that were fiery and intensely personalized. He was revered for the precision of his baton technique, and for his prodigious memory — he rarely used a score in performances — but when he was at his most interpretively idiosyncratic, he used his powers to distend phrases and reconfigure familiar balances in the service of an unusual inner vision. “He is clearly a brilliant man,” John Rockwell wrote in The New York Times in 1979, “perhaps too brilliant to rest content with endless re-creations of the standard [repertoire]. He is also, it would seem, a coldly defensive man, and perhaps that coldness coats his work with a layer of ice. Perhaps because he grew up in the limelight, conducting orchestras from the age of 9, Mr. Maazel was self-assured, headstrong, and sometimes arrogant: When he took a new directorship, he often announced what he planned to change and why his approach was superior to what had come before. He knew what he wanted and how to get it, and if he encountered an immovable obstacle, he would walk away, also with a public explanation. That was how he handled his brief term as general manager and artistic director at the Vienna State Opera, where he was the first American to wield such power. He quickly transformed the house from a repertory company, where a different work was staged every night, to what he called a “block” system, in which groups of opera were played, with frequent repeats. He regarded this as more efficient and likely to produce better performances. When the Viennese culture minister differed, and also complained about Mr. Maazel’s casting choices and argued that he was mainly interested in burnishing his own artistic profile, Mr. Maazel abruptly resigned, two years into a four-year term, and wrote an Op-Ed article for The New York Times deploring interference in the arts by government officials with no artistic background. 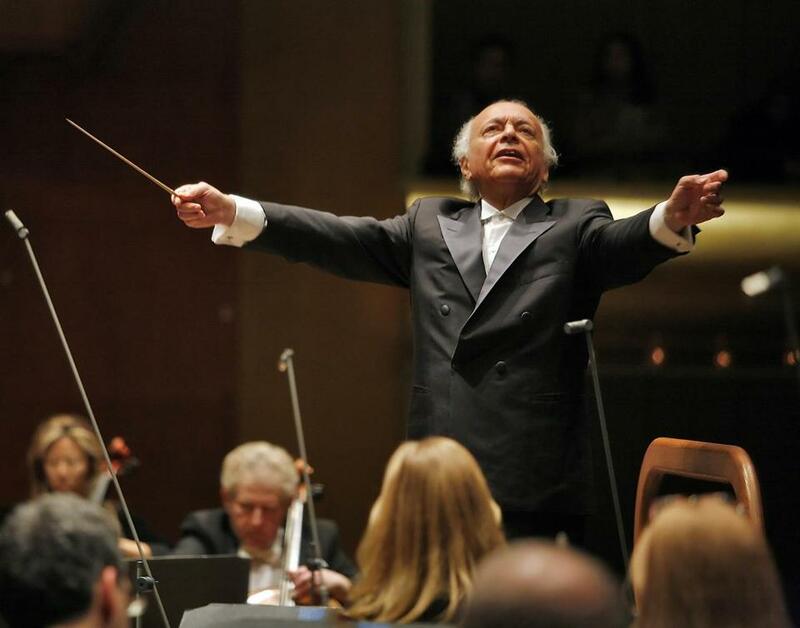 In New York, Maazel quickly won over the Philharmonic musicians. But several critics, while happy that the orchestra had engaged an American music director for the first time since Leonard Bernstein gave up its podium in 1969, were disappointed that Mr. Maazel, 70 at the time, was of the same generation as his predecessor, Kurt Masur (then 73), and that his tastes in contemporary music seemed conservative. Eventually, he won many of them over. Lorin Varencove Maazel was born in the Parisian suburb of Neuilly-sur-Seine to a pair of American music students — Lincoln Maazel, a singer, and Marie Varencove Maazel, a pianist — who were studying there. When he was 5, by which time the family had moved to Los Angeles, he began studying the piano, and at 7, he took up the violin. One piece in his piano repertoire was a reduction of Haydn’s “Surprise” Symphony, and when he was 8, his father gave him a copy of the full orchestral score. Lorin studied it, along with a recording his father also bought him, and when he conducted a family ensemble in the work, his parents noted that he was adept at cues and balances. They took him to study with Vladimir Bakaleinikoff, then an associate conductor with the Los Angeles Philharmonic. They also sent young Lorin to music camp at Interlochen, Mich. That summer, the Interlochen orchestra performed at the World’s Fair in New York, and Lorin conducted them twice. In 1940, just before his 10th birthday, he conducted the Pittsburgh Symphony, and when he was 11, in July 1941, Arturo Toscanini invited him to conduct the NBC Symphony in a concert — works by Wagner, Mendelssohn, and Dika Newlin — broadcast nationally from Radio City Music Hall. The orchestra, outraged at the idea of being led by a child, greeted him at the first rehearsal with lollipops in their mouths. He won their respect the first time he stopped the rehearsal to point out a wrong note. In summer 1942, and again in 1944, he led the New York Philharmonic in performances at Lewisohn Stadium. But when he turned 15, he put his baton aside and settled into his academic studies at the University of Pittsburgh. An invitation from the conductor Serge Koussevitzky to conduct the Boston Symphony Orchestra at Tanglewood in summer 1951 brought him back to the podium just before he headed off to Rome, on a Fulbright fellowship, to study Renaissance Italian music. Mr. Maazel dated the start of his mature career to Christmas Eve 1953 when, still a student in Rome, he was invited to step in for an ailing conductor at the Teatro Bellini, in Catania. His success there led to engagements in Naples, Florence, and elsewhere in Europe, and then in Japan, Australia, and Latin America. By 1960, he had conducted about 300 concerts with more than 20 European orchestras, and was sufficiently well regarded to win an invitation to conduct “Lohengrin” at Bayreuth, the German shrine that Wagner built to himself. At 30, he was the youngest conductor, as well as the first American, to work there. Mr. Maazel’s first music directorship was that of the Deutsche Opera, in West Berlin, jointly with the Berlin Radio Symphony Orchestra, a position he held from 1965 until 1971, when he accepted the directorship of the Cleveland Orchestra. In Cleveland, as in Berlin, Mr. Maazel took an old-fashioned approach to the job. Instead of conducting barely more than a dozen weeks of concerts and leaving the rest to guests, as was becoming the norm, Mr. Maazel spent most of his year in Cleveland. He recorded plentifully with the orchestra and toured with it frequently. He gave up the directorship, becoming conductor emeritus, in 1982, the year he became general manager of the Vienna State Opera. When the Vienna directorship went sour, in 1984, Mr. Maazel declared himself liberated, free to return to the far-flung guest conducting of his early years. Such performances included, in the arc of his career, more than two-dozen with the Boston Symphony Orchestra. He had been scheduled to lead the BSO on its Asian tour this spring before he withdrew following an undisclosed accident. In 1988, he became music director of the Pittsburgh Symphony Orchestra. By the time he relinquished the post, in 1996, he had upgraded its performance standards, taken it around the world, and won a Grammy with the orchestra for a recording of Tchaikovsky and Prokofiev works with the cellist Yo-Yo Ma. He took over the Bavarian Radio Orchestra in 1991, at a salary reported to be around $3.8 million, at that point the highest paid to any conductor anywhere, and held its directorship until 2002, when he took over the New York Philharmonic. After he left the Philharmonic in 2009, Mr. Maazel set up the Castleton Festival, for classical music and opera, on the grounds of his farm in Virginia. He founded and directed the festival jointly with his wife, the German actress Dietlinde Turban Maazel, whom he married in 1986. Two previous marriages — to the composer Mimi Sandbank and the pianist Israela Margalit — ended in divorce. He leaves his wife and their two sons, Leslie and Orson, and daughter, Tara; and three daughters — Anjali, Daria Steketee, and Fiona — and a son, Ilann, from his previous marriages. Globe reporter Jeremy Eichler contributed to this obituary.